Lot Size: 18,750 Square Ft. This three level 2,300 sqft Skyforest Vintage home was handbuilt in 1947 by a homesick Austrian to replicate his childhood home. All the lumber for this Austrian Chalet was cut from trees from the site itself! The hand-hewn exterior detail is known as Gingerbread Trim and emulates true Austrian Black Forest countryside style. Set on a large private 18,750 sqft fenced lot with city light and valley view, this 4 bedroom (or 3 bedroom and convertible den) and 3 baths features a main level master bedroom with seamless glass shower, slate floors, his and hers sink, Kohler K-700 two person tub on ceramic base, complete with large walk-in closet, stack Asko washer and dryer, Rinnai whole house tankless water heater, storage and work area, and full security system. Second level offers cozy formal dining room, kitchen with slate and wood countertops, classic Detroit Jewel Gas Stove, Kenmore Dishwasher and Stainless Fridge, and garbage disposal. Off the kitchen, clawfoot tub and pedastal sink with attached second bedroom and or den, opening to large living room with handhewn beamed ceiling complete with stone fireplace and outdoor patio. The third level has two more bedrooms with shower and sink and charming family room in between. 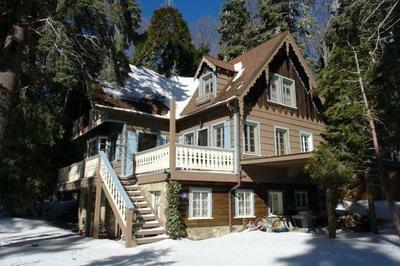 Other features of the home are granite, wide wood plank flooring, original fir flooring, granite foundation, intricate Bavarian Gingerbread Trim, loaded with character and warmth, complete with shimmering City Light and San Bernardino Valley Views. Adjacent 10,320 sqft lot is available for extra. Toured and featured on Kitty Bartholomew's HGTV Design Show titled 'Rustic Austrian Charm' which aired January 20, 2004. Simply one of a kind, screams Vintage Charmer!! Tremendous pride of ownership would simply be an absolute understatement. Sales price included adjacent vacant lot.